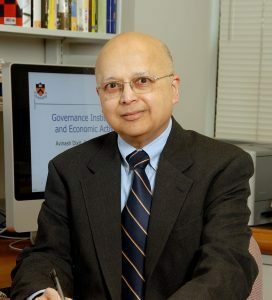 Avinash Dixit is University Professor of Economics Emeritus at Princeton University. He was President of the Econometric Society in 2001, and of the American Economic Association in 2008. He has been elected to the American Academy of Arts and Sciences, the National Academy of Sciences, the American Philosophical Society, and is a Corresponding Fellow of the British Academy. In 2016 he was awarded the Padma Vibhushan. His research interests have included microeconomic theory, game theory, international trade, industrial organization and new institutional economics.